Jaleel Bell (36 points) defended by George Merry (23 points) in the closing seconds of regulation. Where do you start with this one? I did see a full moon on the way to the game! 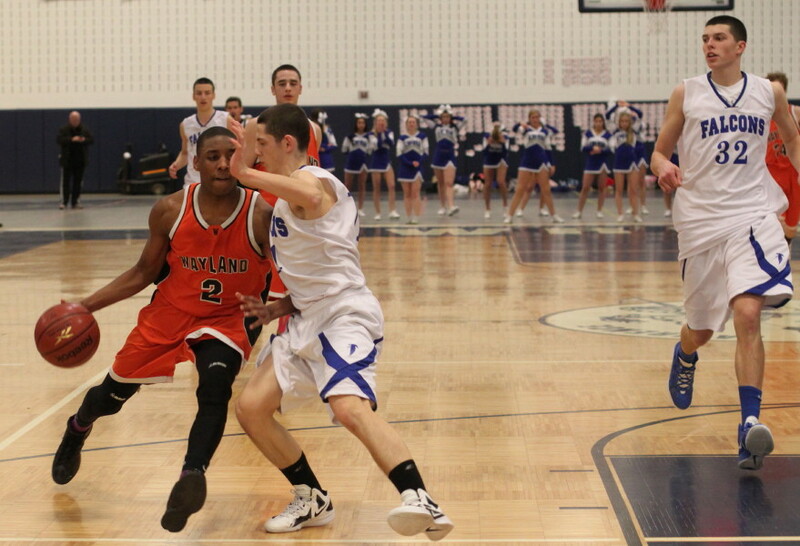 Danvers (#2 seed) trailed 22-11 midway through the second period. 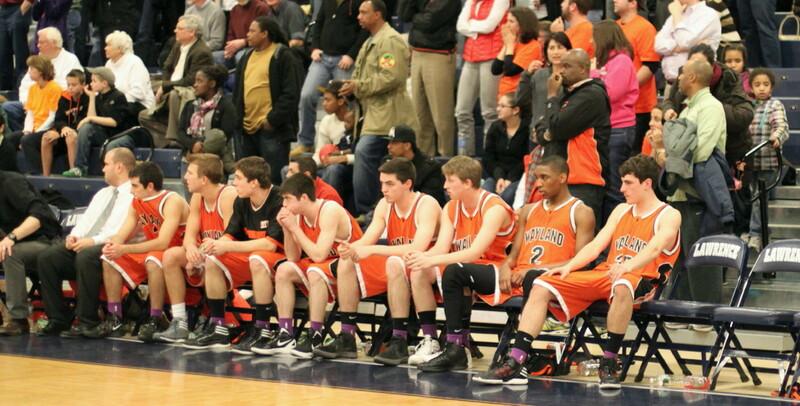 They rallied all the way back to tie the score at 37-37 at the end of the third quarter. 2+ minutes into the final quarter they were behind by ten (49-39) and later 57-47 with 1:28 left in regulation. I thought I heard the fat lady warming up. Bad idea on her part. 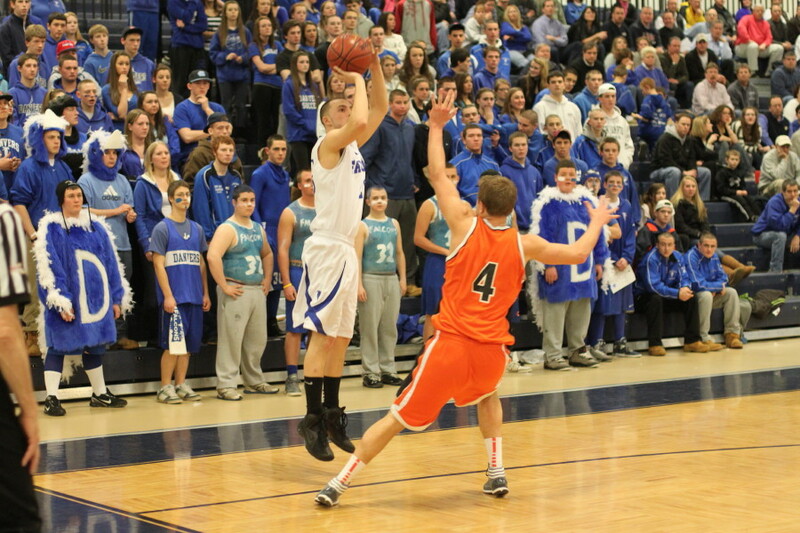 Danvers miraculously came all the way back to a 61-61 tie and forced overtime. 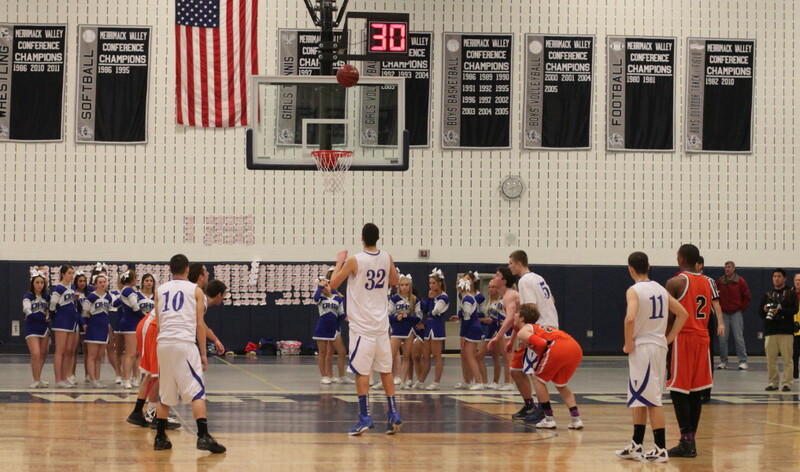 George Merry made all the Danvers points in overtime including five free throws. The frenzied crowd (on both sides) saw five lead changes in the four-minute overtime before George Merry’s layup and two free throws in the last 1 ½ minutes gave the Falcons a remarkable 70-67 win. Danvers (18-4) will now face either Saugus or Arlington Catholic in the Division 3 North finals at the Tsongas Center on Saturday. 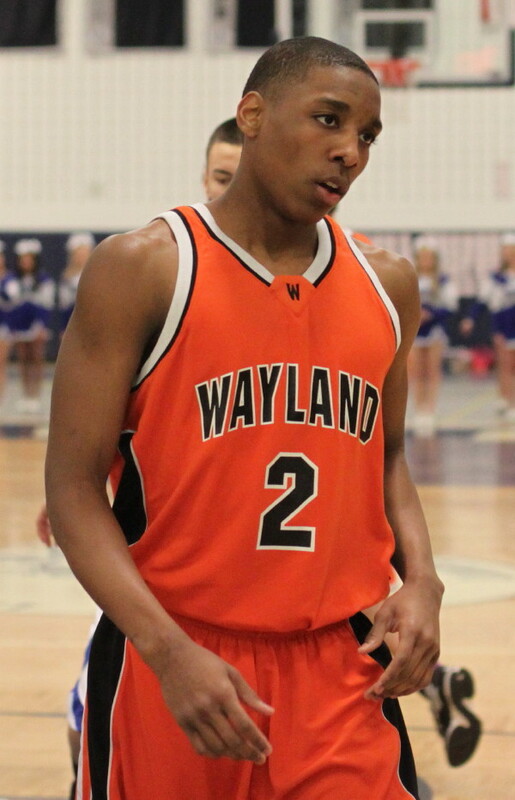 Wayland (16-6) went out in the quarter-finals to Danvers last year (50-46) but I doubt that that loss could have even come close to the anguish this one surely caused the team and their fans. 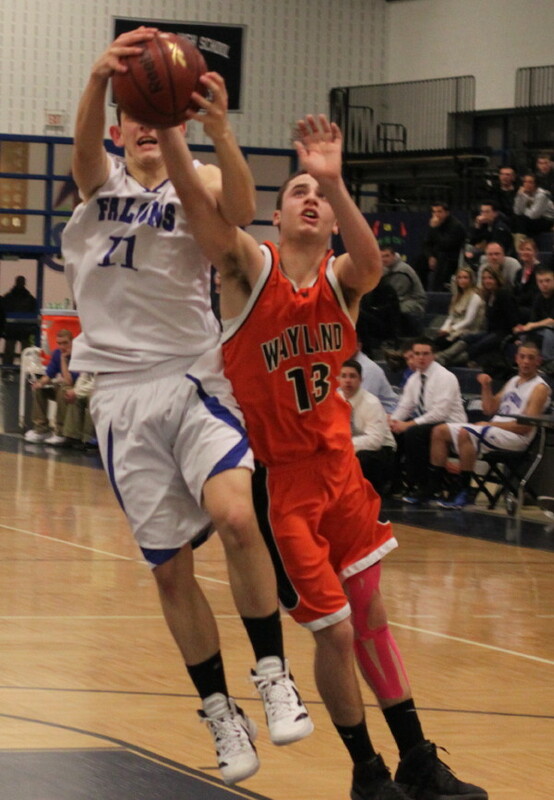 Not only did Wayland squander a ten-point lead in the closing 1 ½ minutes but they still had a chance in regulation for the win. However, Jaleel Bell (36 points) was heavily defended by George Merry in the lane and couldn’t finish as time ran out. That George Merry was still available to apply that game-saving defense was pretty remarkable since he picked up his 4th foul twenty seconds into the final quarter. But DHS coach John Walsh rolled the dice and 6-7 George was there to save the day defensively. In overtime George was there to save the day offensively as he collected all of the Falcon’s nine points including five-for-six from the foul line. 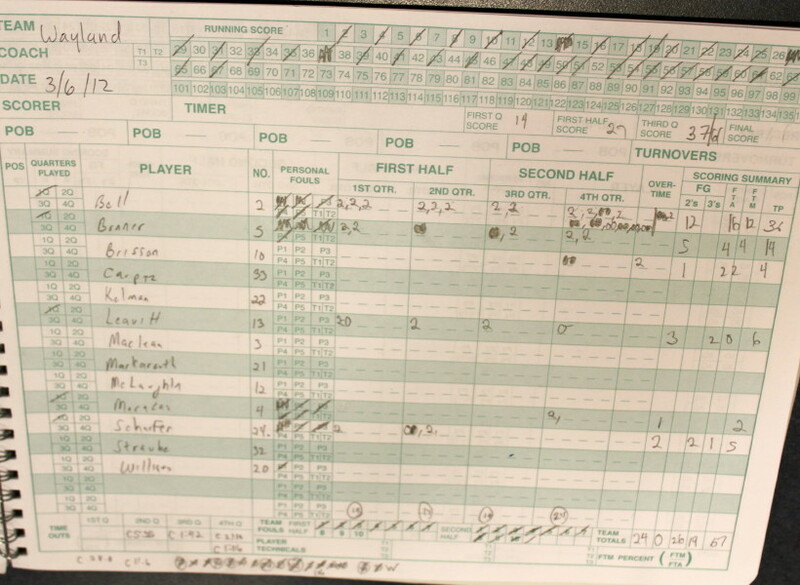 He finished with twenty-three points, totaling fifteen in the final quarter and overtime. 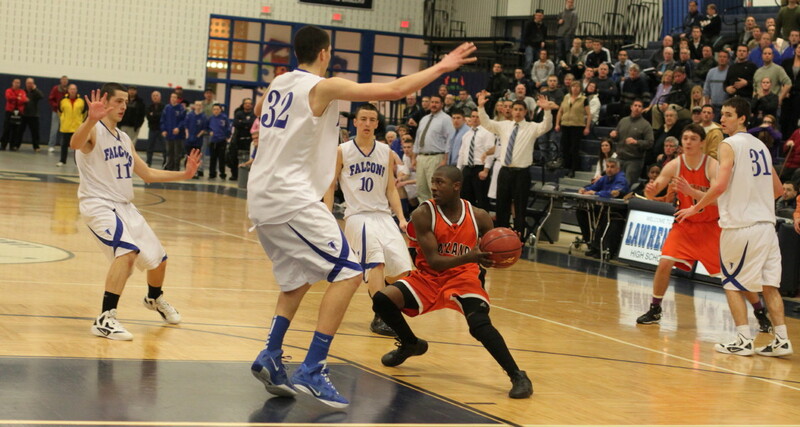 The startling loss took some of the glow off of junior guard Jaleel Bell’s thirty-six points. You talk about a go-to guy. I believe that Jaleel may have handled the ball on every possession. He didn’t fire from long range (the Warriors didn’t make any 3’s) but he could get open for good-look jumpers and layups. 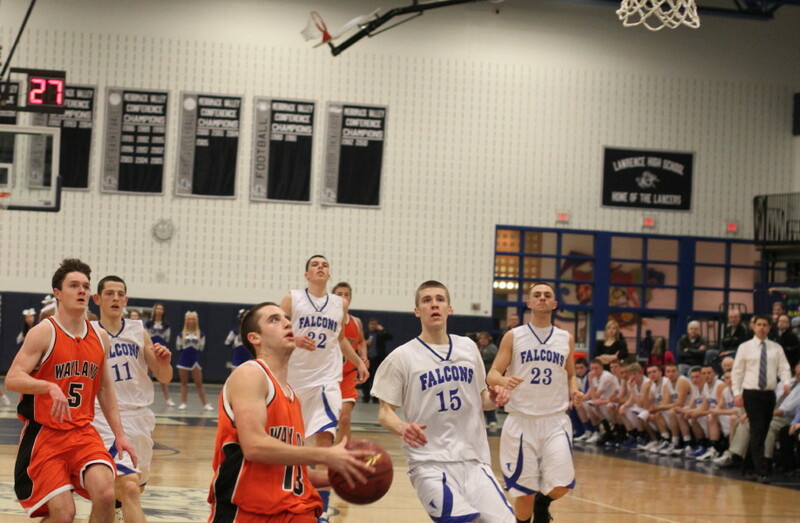 He took the ball at Falcon shot blockers fearlessly and had sixteen of his points in the final quarter. 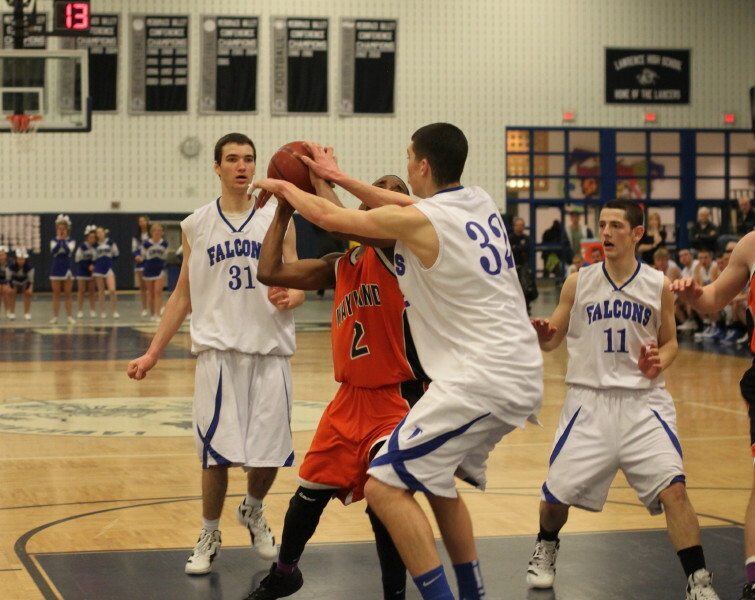 Because Jaleel had the ball so much, Danvers was forced, in the last 1 ½ minutes of regulation to foul him. It was hardly their preference since he had already made six-of-six. But they had to do it and it worked perfectly. Jaleel went to the line eight times the rest of regulation and made only four shots. 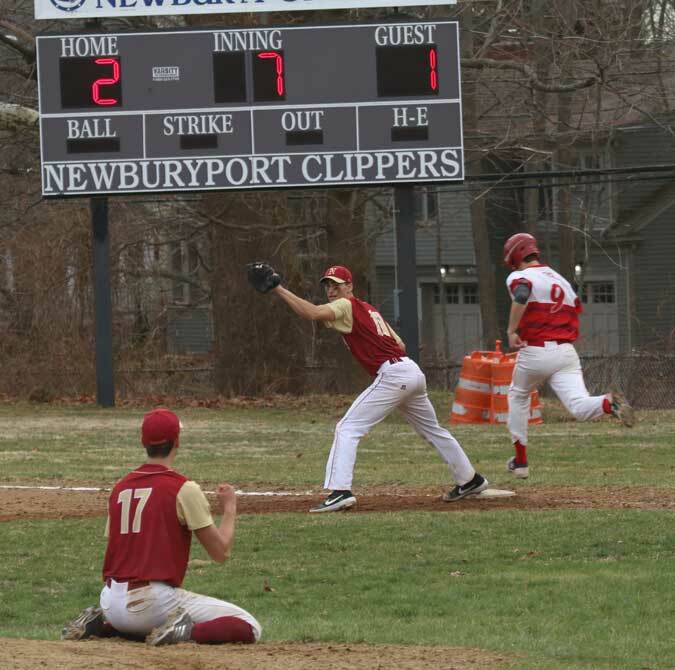 The missed freebies opened the door for the crowd-driven Danvers comeback. Layups by Nick McKenna (off a turnover) and George Merry (pass from Eric Martin) and two season-in-the-balance triples (Nick McKenna and Mike Scarfo) earned Danvers the tie. And when George Merry defended Jaleel into a miss on his regulation-ending layup, the Falcons extended their season by four minutes. 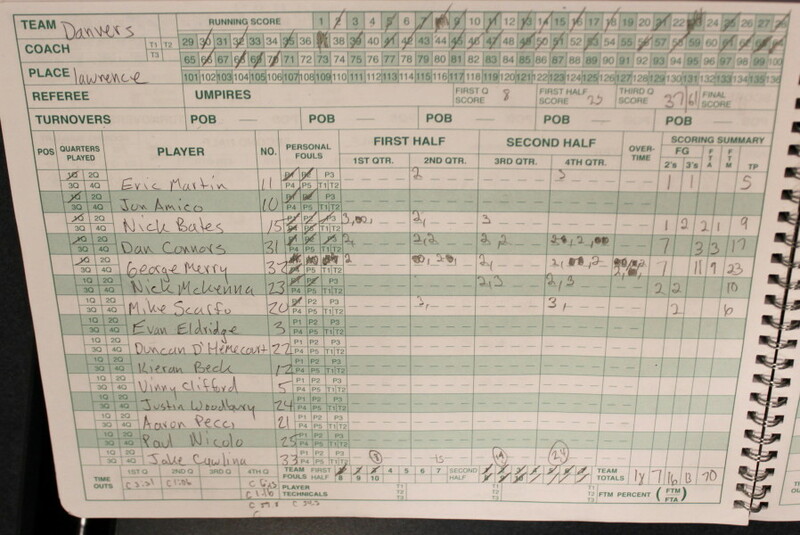 Danvers had six of their seven three’s in the second half. 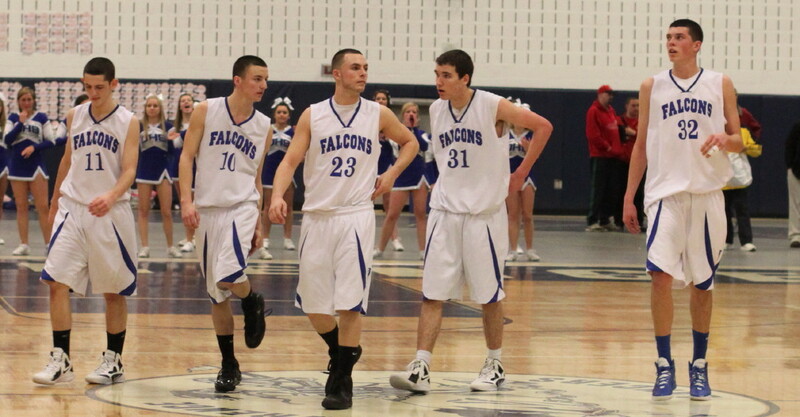 George Merry (23), Dan Connors (17), and Nick McKenna (10) led the Falcon scorers. Jaleel had thirty-six and Mark Bonner fourteen for the Warriors. Jaleel fouled out with eleven seconds left. Almost certainly he would have attempted the game-tying triple if he had been available. Danvers fans rushing the court afterwards prevented the two teams from the ceremonial handshake afterwards.